"A covered dog bed is a convenient way to keep your dogs clean and comfortable. Covers are made from fleece or cotton blends and come in a variety of sizes." Many dog beds come with a removable cover. These covers are machine washable, so that you can keep the sleeping surface of your dog’s bed clean. A covered dog bed allows you to wash your dog’s bedding regularly. Obviously this is more hygienic than beds that cannot be washed or cleaned. Washable bed covers are especially good for dogs that are incontinent or have other medical problems that may cause them to soil their bedding. They are also helpful if your dog gets fleas, because you can then kill the fleas in the dog’s environment by washing the bedding. Dog bed covers are usually made of fleece or something cozy and durable like polycotton blends. Some are made of suede or a faux-suede material. Some covers are reversible - fleece on one side to keep your dog warm on cold days and nylon on the other side to keep your dog cool on hot days. 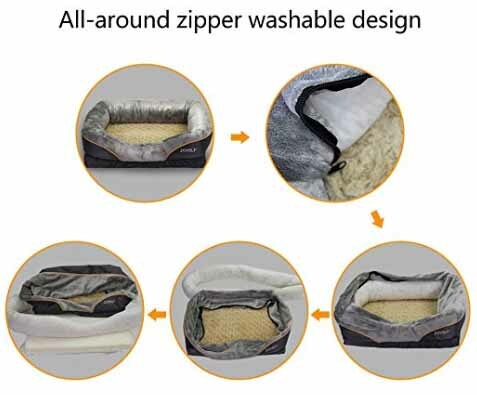 The covers fit snuggly over the dog bed and are fastened securely in place with a zipper or Velcro. Ideally they are easy to remove and to replace. Dog Bed Covers Such As This MicroSuede Waterproof Pet Bed Cover Comes in Small, Medium and Large Sizes for Under $30! Many types of dog beds come with removable covers. A bolster or nest bed is the most commonly used covered dog bed. These beds are round or rectangular in shape, have soft sides, and a cushioned bottom. Not all bolster beds have removable covers, but many do. It should be noted that while washing the cover will remove surface dirt, it may not help if liquid has soaked through the cover into the bedding below. The bed covers are generally not waterproof, and the actual bed may or may not be able to be washed. Waterproof Velour Dog Bed Removable Cover for Under $20! Inflatable dog beds also come with covers that are easily removed and are machine washable. Because the beds themselves are made of PVC, they can be wiped down with a mild detergent and water. They don’t absorb liquid. These beds may be the best choice for incontinent dogs. Extra covers can be purchased for many dog beds so that you have a spare handy if needed. Covers can also be purchased for many dog beds that don’t come complete with removable covers. Or, if your dog bed does not come with a cover, you may be able to make one yourself if you are handy with a sewing machine. If you are handy with a sewing machine, Simplicity offers dog bed cover patterns. Pottery Barn makes a line of dog bed covers that are both stylish and durable. The outdoor cover is made with water repellent polyester canvas (below). The indoor cover is made from faux suede (right below).